How does one know the right stock to invest in and that too at the right price which will ensure strong returns in the long term? This will be a question that will be the uppermost in the minds of most investors wanting to allocate part of their funds towards stocks. Especially in light of the heightened volatility in the markets in the past. The global financial crisis reared its ugly head and sent global economic growth and world stock markets including India into a tailspin. Suddenly there was nervousness all around. Forget bad stocks with bad fundamentals, retail investors in India were loathe to put in their money even in good companies available at attractive prices fearing that prices will fall down further. Then 2013 dawned, signs of recovery began to be noticeable and stock markets surged once again. And with stable government in place, major indices Sensex and Nifty made all time highs and gave hefty returns of more than 30% in the year 2014. Stock market started new year 2015 with a Bang! Now, when Nifty is above 8000 and Sensex above 27,500 level, those who missed out on the current rally are now waiting for the next round of correction to start putting their money to work again. 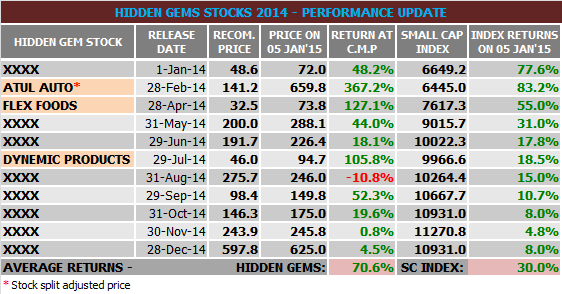 We are pleased to share that Hidden Gems (Unexplored Multibagger Small Cap Stocks) and Value Picks (Mid Caps with Plenty of Upside Potential) recommended by our equity analysts in 2014 have outperformed small and cap index and mid cap index by wide percentage points ensuring much better returns for our members. As illustrated in the table above, average returns (as on date) of Hidden Gems stocks recommended in 2014 is 70.6% compared to small cap index average returns of 30%, Hidden Gems out performed small cap index by 40.6%. Our top performing Hidden Gems of 2014 were Atul Auto, Flex Foods and Dynemic Products, all 3 stocks have achieved their target price giving returns of 367%, 127% and 106% respectively in period of 6 to 12 months. Our Value Picks stocks of 2014 also outperformed Mid Cap Index. Average returns (as on date) of our Value Picks stocks is 27.9% compared to average returns of 18.2% of mid cap index. Our research team has not released Value Picks for couple of months in 2014, hence total recommendations are less compared to Hidden Gems. However, more important is to ensure that we suggest you to pick the right stock ensuring that you get handsome returns on your investments in medium to long term. We also take this as an opportunity to inform our readers that our Combo - 3 (Annual subscription of Hidden Gems and Value Picks) is the best selling subscription service at Saral Gyan, we have registered maximum subscription of Combo 3 during 2014 followed by Wealth-Builder (an offline portfolio management service). Subscribe to Hidden Gems & Value Picks and start investing systematically in fundamentally strong small and mid cap companies. Avail attractive discounts by subscribing to our combo packs, click here for details.